Very often, we hear that it is not possible to cast two spells in a single turn unless one of them is a cantrip. To that we say, “Balderdash!” If someone says this to you, you have our permission to slap them with a Player’s Handbook and then direct them here. This article will explain why this misconception exists and the circumstances in which you are allowed to cast multiple spells in a turn. This article will focus on those spells which have a casting time of 1 action, 1 bonus action, or 1 reaction, as they are the spells which are typically used in combat and which are subject to restrictions regarding what you have cast in a single turn. [When you cast a spell as a bonus action,] you can’t cast another spell during the same turn, except for a cantrip with a casting time of 1 action. This is a narrowly circumscribed restriction that only applies in certain circumstances. Namely, when you cast a spell as a bonus action. Note that there is nothing there which says that you can’t cast two spells. It is the action economy (1 action per turn plus a possible bonus action) that normally prevents someone from, say, casting two fireballs. Now that we have cleared that up, let’s move on to the five situations in which you can cast multiple spells in a turn. This is the exception to the rule that many people know about already (and is directly written into the rules), but it is worth going into because it is also the reason people get confused. As quoted above, when you cast a spell as a bonus action, your other spellcasting on that turn is restricted. This means that if you cast misty step or hex, you can’t also cast a spell of 1st level or higher; you are limited to casting a cantrip. It also means that if you’re a sorcerer and you use the Quicken Spell metamagic option on a fireball in order to cast it as a bonus action, you are also limited to a cantrip when you use the Cast a Spell action. Whether you cast this cantrip before or after the bonus-action spell, the restriction is the same, so plan your turn accordingly. Okay, so this one is a little trickier and requires that you read the item description closely. Some items, such as a wand of fireballs, allows you to use an action to cast a spell from that item. Normally, using an item would mean taking the Use an Object action (PHB 193) on your turn, but in this circumstance these items are giving you a new action: expending charges to cast a spell. Even though this isn’t the Cast a Spell action, you are still casting a spell, and so you are bound by the same restrictions regarding bonus action spells. However, other items such as a necklace of fireballs, do much the same thing but don’t specify that you are actually casting a spell. For those items, you can cast a bonus action spell and then use the action given in that item’s description to cause another magical effect to occur. Therefore, a sorcerer could use Quicken Spell to cast fireball as a bonus action and then throw a bead from a necklace of fireballs as an action to create another fireball. To appease the pedants who will read this and leave angry comments: No, this is technically not casting two spells in a turn. However, it is creating two magical effects and therefore falls under the same general topic, which makes it prudent to mention. Another action you can take to cast a spell aside from your regular action and bonus action is a reaction. Provided that you haven’t cast a bonus action spell on that turn already, if a situation would cause you to cast a spell as a reaction you are not precluded from taking the Cast a Spell action to cast another spell on that same turn. For example, if you move out of a creature’s threatened space and it makes an opportunity attack against you, you could use shield as a reaction to prevent the attack from hitting you and still cast a spell like hold monster on the creature when you are safely out of reach. Anyone with at least two levels in the fighter class can also cast two spells without having to contend with the restrictions on spellcasting. How? Well, they just don’t cast a spell as a bonus action. Instead, they take the Cast a Spell action, use their Action Surge feature to gain a second action, and then take the Cast a Spell action again. If they are an Eldritch Knight of at least 7th level, they can then still use their bonus action to make a weapon attack, too! The information above was verified by close reading of the rules and confirmed by information contained in the Sage Advice Compendium, a compilation of frequently asked questions and their answers, plus clarification of the rules by the game designers. You are free to adjust the rules at your table in a way that you and your players find agreeable, but if you want the “rules as written” answers to whether you can or cannot cast two spells in the same turn, the answer is “Yes, in the situations detailed above”. What are your thoughts on the rules for spellcasting? Share them in the comments below! Sorry to say this, but your approach to this subject is likely to lead to the same confusion that the Sage Advice column has. By focusing on various scenarios by which 2 spells can be cast, you miss how the various rules actually interact when players may try and cast more than 2 spells in their turn, which is possible. Firstly, bonus action casting (any spell or cantrip restricts other spell choices within the turn to cantrips of 1 action casting time. This is important, and is a clause that ties all this together. If you have action Surge, you can use it to cast a spell. If you have also bonus action cast in the same turn, the action surge granted spellcast is under the cantrip restriction because it is in the same turn. So we have now 3 spells in the turn – bonus action spell, action cantrip, action Surge cantrip. Without the bonus action cast we could get 3 spells if one is a reaction spell – action cast, action Surge cast, reaction cast. In that case there is no cantrip restriction at all, as no bonus action cast occurred. Finally, there can be a 4 spell turn. Bonus action cast, action cantrip, action Surge cantrip, followed by some other character triggering an opportunity cast from War Caster. The reaction is to cast a cantrip. But wait! If you cast with a bonus action you cannot cast a reaction spell! Correct, but War Caster allows you to cast a spell with a casting time of 1 action as a reaction. The spell, as written, fulfils the restriction imposed by the bonus action cast, so it can be cast as a reaction. 4 spells in one turn. Unusual but possible. Your comment has a MAJOR error, and I don’t want the community misled. On a turn with Action Surge used, the bonus action spell rule is still applied, and that limit after a bonus action spell is cast is “a cantrip with a casting time of 1 action”. This means 1 cantrip. It doesn’t matter how many actions you have, it is 1 bonus action spell and 1 Cantrip. You CANNOT use a bonus action spell, an action Cantrip spell, and an Action Surge Cantrip spell on the same turn. You are limited to 1 bonus action spell and 1 Cantrip. The Action Surge action couldn’t be used for casting a spell on that turn, not even a Cantrip. Thanks for your comment, Christopher! Note the plural in “cantrips”. Jeremy Crawford also says it’s possible here. I had forgotten about the wild magic surge. It occurs to me that with that, the number of spells you can cast in a turn is theoretically equal to the number of spell slots you have; provided you don’t use a bonus action spell somewhere in there, you could continually cast a spell of 1st level or higher for the 1 in 1,000 chance of getting a wild magic surge with that specific result, then repeat that process until you are completely tapped out. The odds of it occurring are asymptotically close to zero, but it’s possible! We talked about this through another avenue, but putting it here for everyone else’s fun. Addiding to your statement about the limit being spell slots if in a theoretical wild magic surge loop. Any spell 1st lvl or above could activate a Wild Magic Surge that could grant an additional Action that turn. 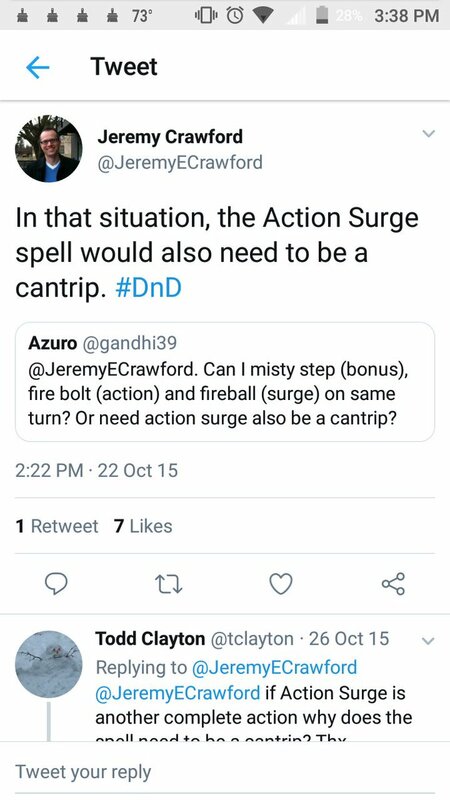 As long as a Bonus Action spell isn’t cast, this could theoritically cause a chain reaction where each spell creates an extra action from Wild Magic Surges. The first limit you would his is the number of spell slots available. For a 20th level Sorcerer, there are 22 spell slots of 1st-9th level spells. Then sorcery points can be converted to create another spell slot (the conversion uses your bonus action, so can only do it once in a turn). This gets you to 23 spells that could be cast directly. After that, magic items can make the user cast a spell. Your last spells Wild Magic Surge action could be used to activate a magic item that has you cast a spell, taking you to 24 spells cast. There is sage advice that makes it clear that spells a user casts from a magic item can be Twinned or counterspell, I havent seen a rueling for if a magic item can cause a Wild Magic Surge (it may exist). One could easily rule they can based on the official ruling about counterspell and Twinned. If it can, then you are theoritically at infinity for a character that has access to infinity magic items/charges. With the War Caster feat, you can cast a cantrip as an opportunity attack in place of attacking with a weapon. Opportunity attacks use your reaction. Chris’ comment is correct.